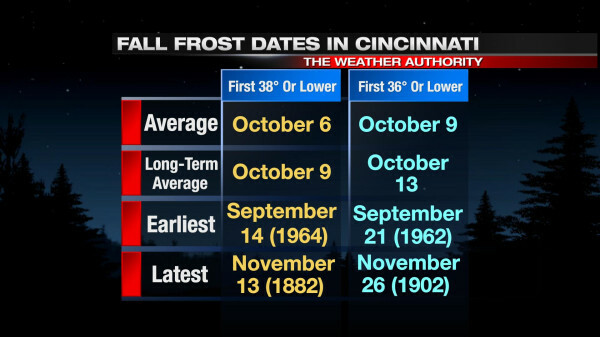 The possibility for frost in the Tri-State rises from mid-September through early October. Our first light frost (a low temperature around 38°) of the season usually occurs in early October but has occurred as early as mid-September. Frost is more likely when the air temperature drops to or below 36°. 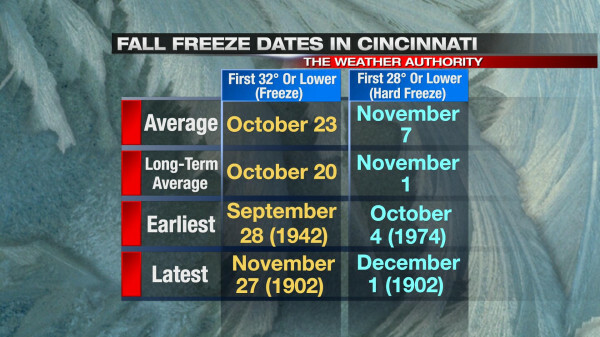 The average date for the first fall morning in Cincinnati with a temperature of 36° or lower is in early to mid-September. A damaging frost, however, can happen as early as late September. The “average” above uses temperatures data from 1981 to 2010, and the “long-term average” uses temperature data from 1871 to 2012. If left outside, your plants will likely have a couple of weeks left before getting their first taste of fall frost. The latest ECMWF Weekly model run suggests late September will be near or warmer than average. I suspect our first frosts of the year will come in early to mid-October this year…right on schedule.